Techies Sphere: How to disable TPM in BIOS (Acer TMP 257 M-521)? How to disable TPM in BIOS (Acer TMP 257 M-521)? Or, Error while enabling BitLocker in Windows 10 Acer laptop “the Bitlocker encryption key cannot be obtained from the trusted platform module (tpm)”. 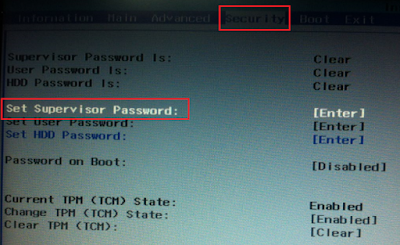 Or, Enable Trusted Platform Module (TPM) option is grayed out in BIOS – Acer TMP 257-M-521. Or, BitLocker encryption asking for PIN instead of password while enabling BitLocker Encryption. Or, How to force BitLocker to use Password instead of PIN? One thing more, this is one culprit which was forcing me to enter TPIN instead of BitLocker startup password while enabling Bitlocker on my laptop with Windows 10 OS. If you want to disable TPM completely for your computer, you should do it from BIOS. In My case, I am using Acer TMP 257. To disable TPM from BIOS of “Acer TMP 257” laptop, please follow below steps. Again go to “Set Supervisor Password” > Hit Enter > Enter your current password > Leave other fields blank and Hit Enter > Reboot your laptop and you are done with Disabling TPM from BIOS of your acer laptop. Now you can proceed with enabling BitLocker with password configurations. What is another option? We do not wish to set a Supervisor password. Hello, Thanks for writing back.. In real we are not setting up Supervisor password as on the last step we are just clearing the password and rebooting the machine. This is just a tricky workaround to disable TPM from BIOS. This is the only available workaround suggested by TechiesSphere which is tested and implemented efficiently..